Do Negative Remarks About Pederson Show Rift With Schwartz? 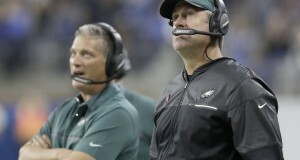 Certain negative comments recently by media analyst Mike Lombardi about Philadelphia Eagles head coach Doug Pederson may show some dissension in the organization related to defensive coordinator Jim Schwartz. For more on this story, click here. The Philadelphia Eagles have traded fan favorite and long snapper Jon Dorenbos to the New Orleans Saints for a seventh-round draft pick in 2019. For more on this story, click here. Howie Roseman and the Philadelphia Eagles have traded for another quarterback. The Birds have sent safety Terrance Brooks to New York for Dexter McDougle. For more on this story, click here. The Philadelphia Eagles have traded offensive tackle Matt Tobin to the Seattle Seahawks for a fifth-round 2018 draft pick. For more on this story, click here. In what had been an expected transaction, the Philadelphia Eagles released running back Ryan Matthews following his “clean bill of health” from doctors following a neck injury last season. For more on this story, click here. The Philadelphia Eagles have signed wide receiver/kick returner Rashard Davis, an undrafted rookie from James Madison. They’ve also released cornerback Mitchell White. For more on this story, click here.